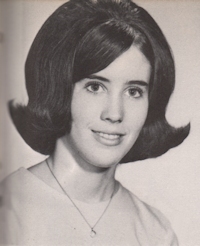 Obituary – Ferrell, Theresa Irene (Golden) « Perry High School Alumni Association, Inc.
Theresa Ferrell, 59, of Perry, Oklahoma, was the daughter of Marvin and Margaret Miller Golden. She was born on March 20, 1951 in Eldorado, Kansas and died on Sunday, April 4, 2010 at her home. On July 16, 2005, Theresa married Richard Dean Ferrell. Theresa was a member of the First Church of the Nazarene, the Missions Council of the First Church of the Nazarene and an honorary member of the Ditch Witch Relay for Life team. She loved spending time with grandkids and enjoyed photography, gardening, scrapbooking. Graveside services will be at the gravesite at 10:00 a.m. Wednesday, April 7, 2010 at Grace Hill Cemetery. Pastor Steve V. Smith will officiate. Services are under the direction of BrownDugger Funeral Home. The family will receive friends from 6:00 to 8:00 p.m. Tuesday, April 6, 2010 at BrownDugger Funeral Home. Memorials may be made to Relay for Life, Judith Karman Hospice or the First Church of the Nazarene in care of BrownDugger Funeral Home, 1010 N. 7th Street, Perry, Oklahoma 73077. Theresa is survived by her husband, Richard Ferrell one son, Chris Simon and his wife, Teresa, of Perry, Oklahoma one daughter, Mandi Justus and her husband, Seth, of Perry, Oklahoma four grandchildren, Brycen Justus, Avary Justus, Jacob Simon and Connor Simon, all of Perry, Oklahoma her parents, Marvin and Margaret Golden, of Perry, Oklahoma and one brother, Kim Golden and his wife, Sheryl, of Coeur dAlene, Idaho.